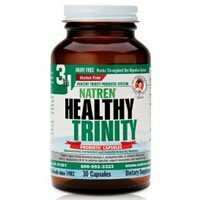 Detailed review of Natren Healthy Trinity Probiotic. See how this probiotic supplement compares against all the others! Overall, at 2.5 out of 5 stars, Natren Healthy Trinity Probiotic is an average probiotic. There are some things I like about this probiotic but also things I definitely don’t like! What I like is that you only have to take 1 capsule per day and the capsules are average size. The product also uses a special delivery system that is supposed to help keep it potent and survive stomach acid. I also like that this probiotic is gluten free, dairy free, and soy free. This probiotic needs to be refrigerated for maximum potency. I find that annoying sometimes and don’t like the hassle of worrying about my probiotics dying. This probiotic is also extremely EXPENSIVE. It costs nearly $70 per bottle and only lasts one month. If I’m paying $70 for a product, I want it to give me fantastic results and I just didn’t see any. This probiotic also just goes overboard with the probiotic cells. At 30 billion CFU, it can actually lead to more side effects such as abdominal pain, bloating and gas. Overall, at 2.5 out of 5 stars, Natren Healthy Trinity Probiotic is an average probiotic because it’s easy to use and pretty allergy friendly but it’s really expensive, may cause side effects, and uses too many probiotic cells. Natren Healthy Trinity Probiotic contains 30 billion cells in 3 probiotic strains. Of note, I really like the use of Lactobacillus acidophilus in the strain profile. This is one of my favorite probiotics and has been used in countless research studies. Another strain I like is Bifidobacterium bifidum. This strain has been shown to help support immune function, decrease allergies, and fight yeast overgrowth. Bifidobacterium bifidum may also help with decreasing inflammation and reducing acute diarrhea. Natren Healthy Trinity Probiotic seems to be allergy friendly. I don’t see any potential allergy concerns other than potentially gelatin. The capsules are non-dairy, gluten free, and soy free. As a perk, this probiotic is also non-GMO. The other ingredients include: sunflower oil, gelatin, and mixed tocopherols. For 30 capsules, lasting 1 month, it costs $69.95. When you break it down, it works out to $2.33 a day to take these. This is so incredibly expensive, even for a probiotic meant for advanced support. It’s actually one of the most expensive probiotics I’ve tried so far. I almost feel like it’s a waste of $70. I definitely saw side effects while taking Natren Healthy Trinity Probiotic. I had stomach pain and bloating, which was a total bummer. I wasn’t happy about that. Please don’t use this probiotic as a daily support, it’s meant for more intense support for a specific ailment. I personally couldn’t find any sort of guarantee for Natren Healthy Trinity Probiotic. This is a huge disappointment! Especially since this is one of the most expensive probiotics I’ve tried. I would hope they’d give you some sort of guarantee for spending almost $70 on a product, but not that I could see! To buy Natren Healthy Trinity Probiotic, click here.